For many people, memories of maths lessons at school are anything but pretty. Yet "beautiful" is a word that I and other mathematicians often use to describe our subject. How on earth can maths be beautiful – and does it matter? I've just finished marking a pile of homework from my second-year mathematics undergraduates. I am struck by two students' contrasting solutions to one problem. Both solutions are correct, both answer the question. And yet I much prefer one to the other. It's not just that one is longer than the other, or that one is explained better than the other (both are described well, in fact). The longer one doesn't quite get to the heart of the matter, it's a bit cluttered with unnecessary distractions. The other uses a different approach, which captures the essence of the ideas – it helps the reader to understand why this piece of mathematics works this way, not just that it does. For a mathematician, the "why" is critical, and we are always looking for arguments that reveal this. Imagine the 10th number in the sequence (because it's easier to draw the picture than for the 1000th!). 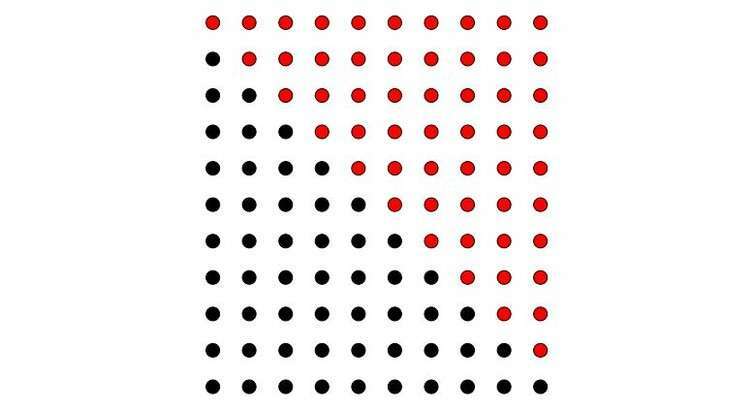 Let's count the dots without counting the dots. We have a triangle of dots, with 10 in the bottom row and 10 rows of dots. If we make another copy of that arrangement, we can rotate it and put it next to our original triangle of dots – so that the two triangles form a rectangle. This shape of dots will have 10 in the bottom row and 11 rows, so there are 10 x 11 = 110 dots in total (see figure below). Now we know that half of those were in our original triangle, so the 10th triangular number is 110/2 = 55. And we didn't have to count them. There are other ways to predict this number. One is to look at the first few terms of the sequence, guess a formula, and then prove that the formula does work (for example by using a technique called proof by induction). But that doesn't convey the same memorable explanation behind the formula. There is an economy to the argument with pictures of dots, a single diagram captures everything we need to know. This is the famous harmonic series. It turns out that it doesn't equal a finite number – mathematicians say that the sum "diverges". How can we prove that? It sounds difficult, but one elegant idea does the job. I don't think this unique to mathematics. There are pieces of music, buildings, pieces of visual art where I have not at first appreciated their beauty or elegance – and it is only by persevering, by grappling with the ideas, that I have come to perceive the beauty. For me, one of the joys of teaching undergraduates is watching them develop their own appreciation of the beauty of mathematics. I'm going to see my second years this afternoon to go over their homework, and I already know that we're going to have an interesting conversation about their different solutions – and that considering the aesthetic qualities will play a part in deepening their understanding of the mathematics. School students can have just the same experience: when they're given the opportunity to engage with rich questions, when they can play with mathematical ideas, when they have the chance to experience multiple strategies to the same question rather than just getting the answer in the back of the textbook and moving on. The mathematical ideas do not have to be university level, there are beautiful problems that are perfect for school students. Happily, there are many maths teachers and maths education projects that are helping students to have those experiences of the beauty of mathematics. Interesting. When I was in grade school we were taught a formula to determine the total of all the numbers summed in a range. For example: what is the total of all the numbers from 1 to 100? The formula was T = n * (n + 1) / 2 where n is the end point number. Look familiar? Same formula for the dot/triangles. Coincidence or another "beauty of math"?